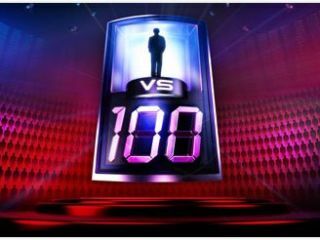 Microsoft is so keen to make a splash with its ground-breaking 1 vs 100 quiz over Xbox Live that it is stumping up real-life prizes like televisions and cars to lure its community into the interactive quiz. The Endemol-produced game, adopting its format from the television quiz of the same name, is an impressively addictive quiz game that sees potentially huge amounts of players divided up into three groups – all of which can win prizes by being the quickest and most accurate in answering multiple choice questions. Microsoft is aiming to really blur the lines between television and gaming by hosting live shows, with a real presenter overseeing and commenting on the action and, for the UK and Ireland, giving some rather nifty prizes when 1 vs 100 arrives 'soon' to Xbox Live. "We are very excited about 1 vs 100," Tania Chee – the UK marketing manager for Xbox Live – told TechRadar. "We are hoping it will be a success and, from what we've seen, people seem to like it. "In fact the more people play it the more excited they get and the thing about the UK is that we are offering real prizes on top of Microsoft points. "So, imagine you are sitting at home and you are the one and you know you can win an HD television or a car, which we have guaranteed we will give away in one of our shows; that's pretty impressive." Only 'the one' can win the major prizes, but those picked for the 100 (the mob) or even in the crowd will be able to pick up Microsoft Points or free Xbox Live Arcade games. TechRadar has had an extended play around with the game, with the live host present and enthusiastic – and it is certainly addictive. Which probably explains why Microsoft is prepared to back the show with its own money, stumping up the prizes to raise the game's profile in its beta year. "We are still going to be pushing this and the proof of that is the prizes behind the series," added Tania Chee. "We want people to get really excited about it. At this point in time we don't have a commercial partner so we are funding the prizes."